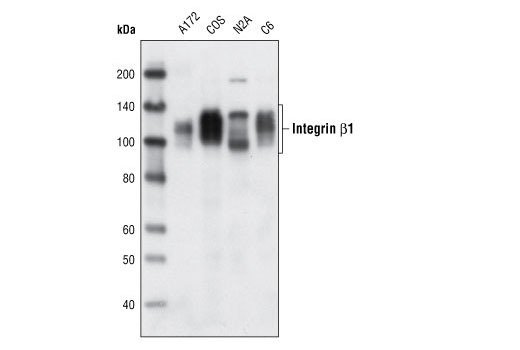 Western blot analysis of extracts from various cell types using Integrin β1 Antibody. Integrin β1 Antibody detects endogenous levels of total integrin β1 protein. Polyclonal antibodies are produced by immunizing animals with a synthetic peptide corresponding to residues surrounding Pro680 of human integrin β1 protein. Antibodies are purified by protein A and peptide affinity chromatography.